� Copyright Dr Paul Lam. Reproduction for nonprofit educational purposes is permitted. If your patient would like to enroll in a Tai Chi for Arthritis class, this is information about tai chi in general, and the special benefits of the Tai Chi for Arthritis program. Tai Chi is a slow moving meditative exercise that began in ancient China, around 500 years ago. Tai Chi combines stress reduction with movement to improve health. Dr. Paul Lam, from Sydney, Australia is family practice doctor who developed Tai Chi for Arthritis for people with arthritis and elderly people with balance problems. Dr Lam developed the form with input from rheumatologists and physical therapists. What are the benefits of Tai Chi for Arthritis? What is some of the research behind Tai Chi? In the British Journal of Sports Medicine, 2001 June 35(3): 148-56, Dr. J.X. Li, et al., reported on "Tai Chi: physiological characteristics and beneficial effects on health" that tai chi rated as a moderately aerobic exercise. Who practices Tai Chi for Arthritis? 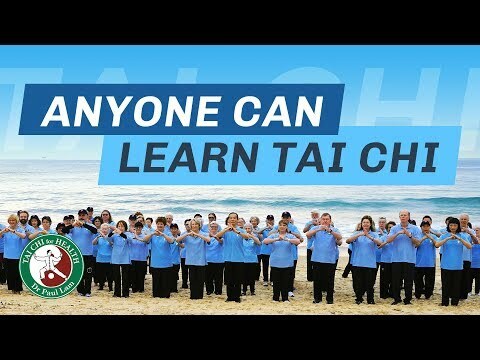 Tai Chi for Arthritis has been officially adapted as the tai chi form used by the Arthritis Foundation of America; supported by Arthritis Foundation of Australia and Arthritis Care of UK. Thousands of people practice Tai Chi for Arthritis in the U.S. and internationally. How can you encourage your patient to benefit from Tai Chi for Arthritis? Complete the Participant Enrollment Form for your patient (download from Arthritis Foundation Australia's website). Ask them about their tai chi practice when they come in for regular visits. Monitor the effect of tai chi on their report of pain, flexibility, and balance.